As part of their 8th anniversary celebration, one of Papertrey Ink's challenges is to create a card inspired by the oh so talented Maile Belle. My pleasure! Hoping to catch up with other challenges tomorrow. My inspiration for this card comes from the incredible Julie Ebersole. 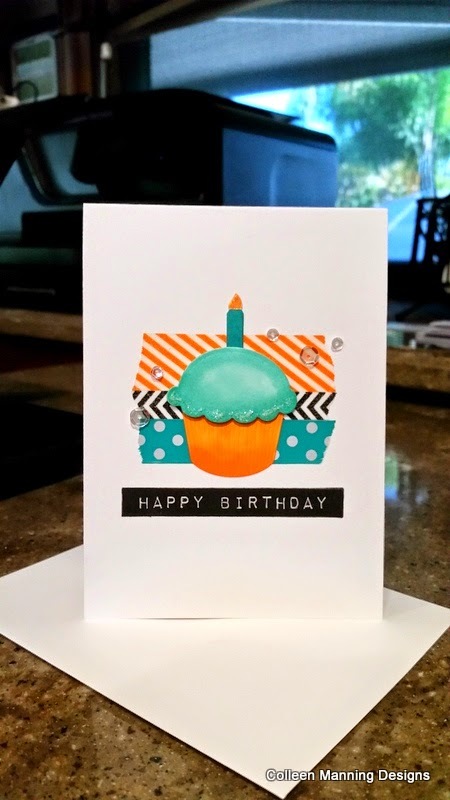 She often uses washi tape for pops of color and interest on a one layer card, and I wanted something hip and modern for my uber cool niece, Ashley. I don't think she visits my blog, so no spoiler here. 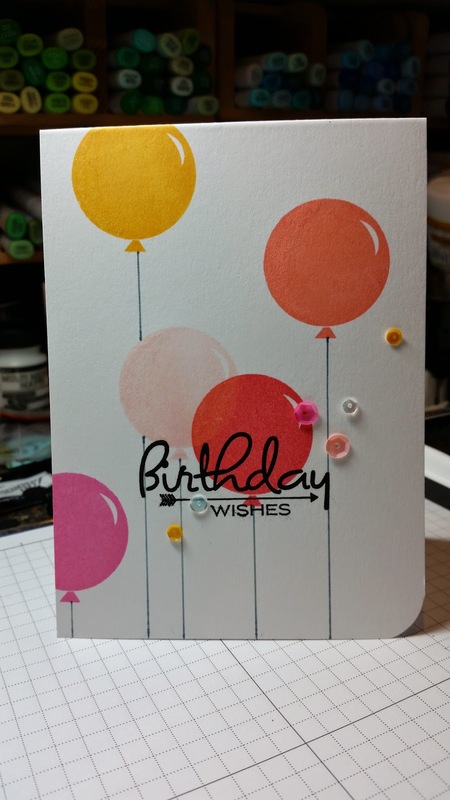 I chose Impression Obsession's cupcake die, Altenew's sentiment and Pretty Pink Posh sequins. I shaded the cupcake with copic markers, and popped the "icing" portion of the cupcake with dimensionals and added Rock Candy Stickles. This card came together so easily, I think I'll make a couple more. Just want to share this card. If you'd like details, you only need ask. Whew! Less than an hour ago I checked Nichole's blog and realized I could still participate in this month's Papertrey Ink blog hop challenge. Luckily for me, this month's challenge was super easy - a color and sketch combo with the most difficult thing being deciding which Fast Food combo to choose. So I quickly pulled out these scrumptious colors and got to work. And I love the result! The only ingredient not PTI is the array of enamel dots from Teresa Collins and My Mind's Eye. Yippee for me! Seldom do I fall so in love with a stamp set that I pre-order it but, after watching a Jennifer McGuire video here, these stamps with matching dies were a must have. They've been so much fun to play with, trying different color combos and creating a pile of flowery, leafy goodies to use. Naturally then, when I needed to make my friend Carol a birthday card, I reached for my favorites from these little gems. Carol is such a talented card maker, that it's always a challenge for me to come up with something unique for her special day, but I knew these were just the thing. 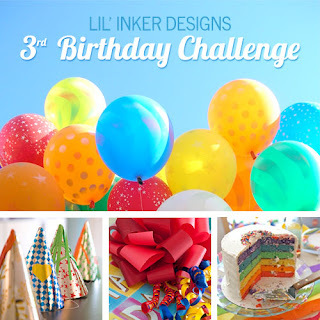 Lil' Inkers is three (!) years old this August and celebrating with a challenge. You can check out all the details here. Being a huge fan of Lil' Inkers products, and particularly the balloons stamps and dies, I knew I just had to find time to participate. 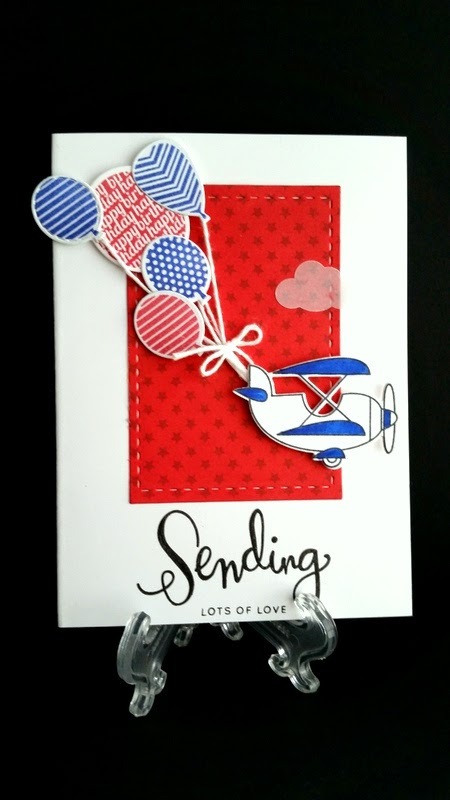 All the wonderful colors of the balloons and their arrangement in the challenge photo inspired the card below. I hope you like it as much as I do. And thanks for the visit! All products, with the exception of the Hero Arts red metallic dots, are from Papertrey Ink. It's been ages since I participated in a challenge, much less TWO challenges in the same day! Yay me! (My submission for the Avery Elle May Challenge is below.) I only recently discovered Ardyth's blog through Pinterest and love her CAS style and use of bright colors. A true kindred spirit. So to make a birthday card imitating her style for OLW142 was right up my alley. I stamped a candle from a PTI set and a sentiment from Wplus9. Then I matched the Hero inks I used for the candles to Copic pen colors to fill in parts of the sentiment. It really changed the look of the card. Much more festive now. A little added bling on the candles and flames completed the look. I really like the way it came together and think I'll make a couple more of these in different colors. Yes, it's been a while. So long that I have to figure out Blogger all over again. . . that'll teach me. A few months ago I stumbled on to the Avery Elle website and was smitten by their stamp line and purchased a few of their sets. 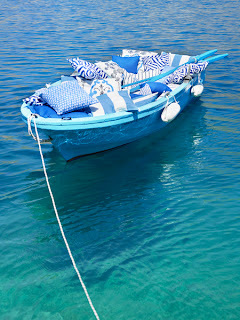 I don't always hop on board with new trends in stamping (more likely, I'm late to the party), but I absolutely adore the new nautical and ombre themes I'm seeing everywhere. They're so modern and fun, and a reminder that summer is coming. Now this photo challenge nudged me from my online hiatus, and inspired me to get inky and participate. Happy 1st Anniversary, Avery Elle! The second challenge at Ellen Hutson's "The Classroom" for World Card Making Day was to be inspired by a the Pinterest photo to the left. Being drawn immediately to the pattern on the bedspread, I chose a stamp from Impression Obsession and stamped it in white and clear embossed it. Then, using Distress Ink's Spun Sugar and Papertrey Ink's Winter Wisteria, I applied ink to the card base. The white embossed image resisted the inks and gave me the look I was going for. I chose black for the sentiment to bring in the black pillows from the photo. 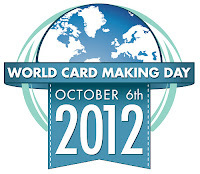 I'm thrilled to finally get some play time in my "rubber room" and participate in World Card Making Day! It seems like forever since I made a card. In honor of WCMD, "The Classroom" is hosting a day of challenges from some awesome designers with a prize of a $150 gift card to Ellen Hutson's store up for grabs. The first challenge was to "create a holiday greeting", and since Julie used a collage of holiday sentiments on her sample card, I took the "greeting" part of the challenge literally. Starting with a Tim Holtz alterations folder, I created an embossed greeting layer and colored with a real red marker from Stampin' UP! a couple of the words for emphasis. Then I die cut a poinsettia using Spellbinder's dies, adding some gold bling to the center. A scrap of ribbon for leaves and a cherry cobbler card base and done! Whew! Boy am I rusty! But it definitely feels good to get inky. My niece is expecting her second child, and this is the card I sent to the happy couple. The adorable owl is from Whimsy Stamps, and I colored him with Copic markers. Very CAS. 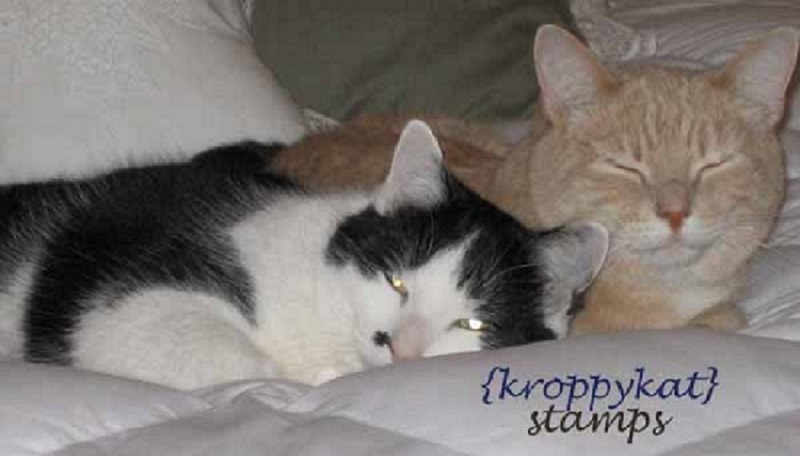 Anyone going to Stampaway in Cincinnati this Friday night or Saturday (or both)? It should be a great show! Your challenge is to create a project using the limited supply list provided below. 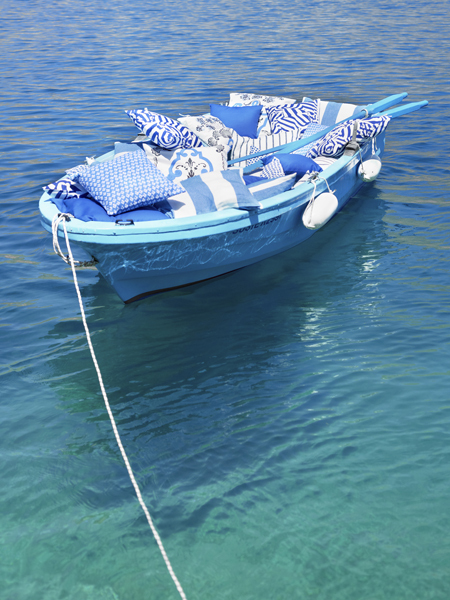 You can choose to re-create one of the designer projects or design something all your own. These are the specifics that were provided to each of the team members. You can use as many or as few as you like and any inks you prefer. You may also add in dies, twine or glitter if you desire. Please do not use any other products besides those listed below, however you can substitute the Natural Beauties stamp set for another floral set if need be. For my entry, I chose Pretty Peonies since I do not yet have Natural Beauties. Thanks for stopping by.